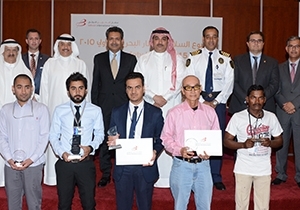 Muharraq, Bahrain, 2015-12-9 — /Travel PR News/ — In close co-operation with the airport community and partner companies, Bahrain Airport Company (BAC), the operator and managing body of Bahrain International Airport (BIA), launched the 5th edition of its annual Safety Week under the theme of ‘Construction Safety at BIA’. In light of the surge in construction activity on the new BIA Passenger Terminal Building and the overall Airport Modernization Program, this year’s focus is on endorsing the significance of shared responsibility and call to action. BAC’s 2015 safety drive was commemorated with an opening ceremony at the Movenpick Hotel in Muharraq and was attended by key representatives from the airport community. Guests included the Assistant Under Secretary for Safety and Aviation Security – Civil Aviation Affairs at the Ministry of Transportation and Telecommunications, the CEOs of Gulf Air, Bahrain Airport Services, Bahrain Airport Company as well as the Managing Director of G.P Zachriardis to name a few. Safety Week has been organized annually by BAC in collaboration with its airport partners and the campaign reiterates BAC’s efforts to maintain the highest health, safety and environmental standards across the airport’s operations, in accordance with global industry best practices. The 2015 Safety Week builds on three key pillars: Safety Strategy for the Airport Modernization Program; Safety, Welfare and Wellbeing Promotion; and Collaboratively Identifying and Overcoming the Challenges at hand. It further discusses best practices related to operating heavy machinery, Foreign Object Debris (FOD) in the airport environment, defensive driving and night-time safety. All these elements combined support BAC’s continued efforts to meet BIA’s safety goals and uphold the airport’s admirable safety record. Speaking at the opening ceremony, the CEO of Bahrain Airport Company, Mr. Mohamed Yousif Al Binfalah praised the efforts of all BIA staff and partners in adhering to the best safety practices in their respective areas and help BAC further its mission in sustaining the airport’s reputation as an efficient and above all safe workplace and environment. Mr. Al Binfalah said “BAC has a commitment to operate the Kingdom’s national gateway with the most stringent of safety standards, not only on the airfield but across the airport premises. It is our mission to sustain an optimal environment and safeguard the well-being of everyone who accesses Bahrain International Airport”. Mr. Jose Mendes, Director of Safety and Security at Bahrain Airport Company, further reinforced the safety goals established for the Airport Modernization Program and added “The ultimate success is dependent on all of us working together with the common purpose of ensuring safety and security for everyone at Bahrain International Airport and the environment in which we operate. Let us all continue working together and remain determined for the success of the Airport Modernization Program and the prosperity of the Kingdom of Bahrain”. The 2015 Safety Campaign ran for a week and included a series of activities such as panel discussions, site visits, inspections and training. Interactive educational dialogues and activities for all staff across the airport airside and construction worksites also took place. This entry was posted in Airlines, Airports, Transportation, Travel, Travel Management, Travel Safety, Travel Services and tagged 'Construction Safety at BIA', 5th edition of its annual Safety Week, Bahrain Airport Company, Mr. Jose Mendes, Mr. Mohamed Yousif Al Binfalah. Bookmark the permalink.